With each of our plugin review posts - we have an accompanying creative post - not just whether the plugin is useful, but in action how does it look, funcion and how is it creatively used by designers within their sites. We like to share a few examples from sites that we have seen, or have been featured in site showcase in order to see a range of use for the product. 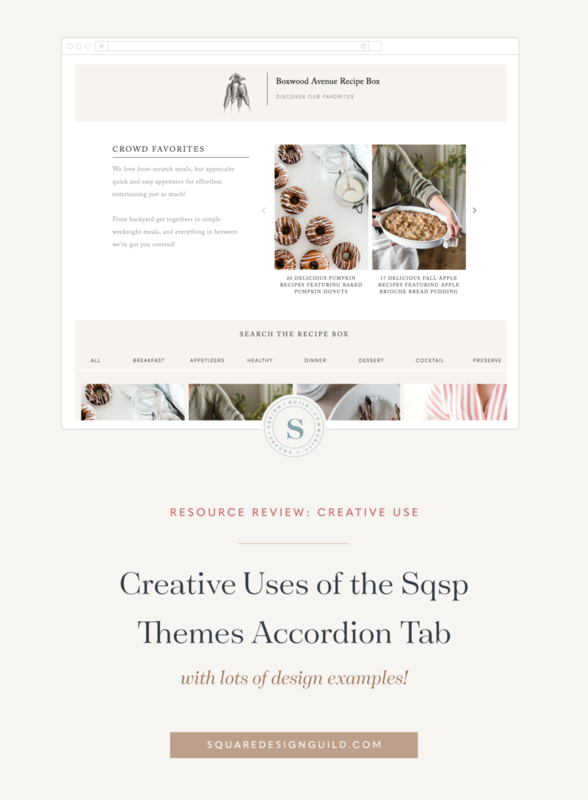 If you haven’t had a chance to read the full review of the SqspThemes Accordian Tab Plugin, check out the post HERE. Let’s quickly review WHAT this plugin is capable of doing, so we can understand the possibilities of the design and the potential it has for layout etc. The basic concept is that you create a tabbed section // link - link - link // where with each section it’s like opening up a new tab in your browser with content. The page you are on stays the same, however the content is different. Meaning you have the chance to have complex or multi-structured content that doesn’t need to be seen on each page. The obvious use for this is to have a multi-section for services. I use it for that on my own site, and have used it for my clients sites as well. Let’s look at these multi-tab for info/services sections. As you can see we are using the tab in a simple way to keep services names near the top of the page, and easy to navigate through without tons of scrolling. the design here keeps the tabs simple, but effective in another simple tabbed page. For this school’s website the idea was to simplify the admissions process, so when someone was looking for data, they had it all at hand, and easy to organize. The basic concept is that not all info needs to be in a long page, that sometimes tabbing over to another section better suits the content than a long scroll. The next way to think about how this plugin can be used is to think about categorizing content. So instead of scrolling, scrolling scrolling to new sections for categorizing summary galleries, that you are separating them out. This example is PERFECT for those who want to have categorized galleries for portfolios etc. You can create a simple, and minimal tab (almost not there!) to organize galleries and not be stuck with a boring gallery page. This client’s goal was to create a design where you could see LOTS of content from the homepage. Here we designed a tabbed feature section to see specific posts for the season. As you can see - she’s highlighting the holidays! So think creatively! This example provides a similar concept to the first one for a gallery, but using blogger recipe categories. This way you can have a recipe box that isn’t scrolling through hours of text-block links. See the function for more than just a tab! Once you start to see the function of how to use the content you can start to see the potential in really using it to create dynamic flow, keep users on the same page, but interact with content in a different way. Hopefully we gave you some examples that spark some interest for you, and let you see that once you start looking at the potential, and the possibilities with seeing the plugin as a feature-full concept it will become a dynamic part of your designs on an everyday basis. We think it’s designed and executed brilliantly - and wish we had thought of it ourselves. Join in on the tabbed fun HERE. Read the formal review post. Find this plugin in the SqspTheme’s Shop!